The blind spots of a car prevent the driver from having a global view of the environment when driving. This circumstance is dangerous and is the cause of numerous accidents. The new evolution technologies have allowed moving from a rudimentary mirror to a complex system of cameras that allow minimizing the hidden areas. These types of advances, together with a series of easy-to-apply tips, minimize the blind spot and make driving safer. The blind spots are spaces that the driver does not have access to the look. The view is the most important sense when you are at the controls of a vehicle; it allows to have a perception of the environment. The diminution of the field of vision makes it difficult to know the state of the road and the rest of the objects that occupy it. To avoid blind spots, the most common system is the rear view mirror, but new technologies have incorporated important advances such as rear cameras or motion sensors that have become interesting tools to increase the field of vision. Not all cars have the same dead angles. The blind spots will depend on the geometry of the vehicle, its size and its design. The chassis creates spaces that make it impossible for the view to cover the entire environment. 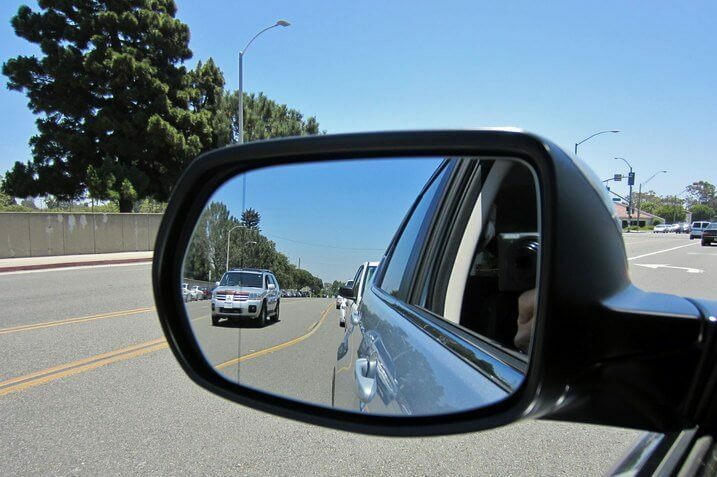 Although the rear view mirrors try to cover a wider angle of vision than would be achieved naturally, they are insufficient to cover the entire environment. Each model has its own style that can influence the blind spots that the driver has. In general, the most important blind spot is the one that lies between the back and the side. This small space is located between the field that includes the rear view mirrors and the natural vision that the driver has from his window. Another point to pay attention is the front corners, since some models have a chassis with slats that, although they serve to increase the strength of the car, they minimize the field of vision, especially when driving through roundabouts. Two-wheeled vehicles also have blind spots. The lighter is located in the back. There are also limitations in the vision of the sides. However, it is necessary to point out that bicycles allow a greater movement for the cyclist, who can turn his head to reduce the blind spots. The helmet used by motorists limits the front field. However, the vision is quite good, except in the back. The use of mirrors allows knowing what happens on the sides and gives a slight idea of the objects that are behind, but the pilot’s own body prevents them from having a global view of the environment. Due to their size, commercial vehicles tend to have more blind spots than cars. The lateral space to which there is no access with the eyes is wider and must be added the impossibility of knowing what happens in the back, because normally the rear door does not include a glass. It is a very common vehicle in urban centers, so it is necessary to know what your vision is like at the wheel and understand how the driver acts. Thanks to its wide rear-view mirrors, a bus provides a good view of the right side, which its passengers use to go up and down. However, it has dead angles on the left and rear tangents. Position the mirrors correctly. Before starting the vehicle it is advisable to make sure that the mirrors are well calibrated and that you have a good vision. This type of recommendation is especially important if the car is used by several people. Adjust the side mirrors. The mirrors located on the sides of the car are tremendously useful to avoid blind spots. To be properly adjusted it is necessary to leave a small space so that the end of the car is visible. If you do not leave this spatial reference, you run the risk of making inaccurate calculations, while if the body occupies a larger space you are missing the opportunity to cover a larger field of vision. Use the turn signals. If you are going to perform a maneuver that involves a change of lane or direction is mandatory to use the flashing lights. There are some drivers who do not use these signals when they are driving on a lonely road because they are considered necessary. This type of attitude can lead to collisions, as there may be elements in the blind spots. Pay attention at the roundabouts. These places are a delicate space, because changes of lane take place and sometimes there are vehicles that are in the blind spots. For this reason, it is necessary to take extreme precautions and announce the maneuvers that will be carried out to the rest of the drivers. Be careful when opening the doors. Being parked does not mean that you pay attention to the blind spots of the vehicle. Going carefully and looking back in case a car or bicycle comes can make sure there are no unnecessary scares. Do not stand in the blind spots. Once the spaces that are more difficult to cover with the vision are known, it is advisable not to place them unless it is necessary. The blind spot is a space that is not covered by the field of vision. Although it is impossible to completely eradicate all blind spots, there are tips and technologies that minimize their incidence. These types of recommendations are very useful and reduce accidents.